Roz and Phil Sky pal around with the Nittany Lion. Phillip B. Sky, a graduate of Penn State University Park and longtime friend and supporter of Penn State and Penn State Altoona, passed away on June 16, 2017. Surviving are his wife of nearly 54 years, Roz Roth Sky; daughter, Tobi, and her husband, Dave Rispoli; son, Izzy, and his wife, Dana; and grandchildren, Sam and Mandy Sky and Tyler and Casey Rispoli. Also surviving are his brothers and sisters, Ted and Vera Sky, Asher Sky, Marcia Sky Bregman, and Davida Sky, and many special family members. He was preceded in death by his parents, Israel and Tessie (Cohen) Sky. Sky graduated from Altoona Area High School in 1958 and Penn State in 1962. While at Penn State, he was introduced to Roz, a University of Pittsburgh student, and the two married in 1963. After serving in the army as a cook in 1963, Sky discovered he had an interest in the culinary arts. He went on to work at the Four Seasons restaurant, the Newarker at the Newark Airport, and Best Provisions, Inc.
Before permanently settling in Altoona in 1971, the couple lived in State College where they owned and operated various food business enterprises. In Altoona, Sky joined his family’s business, Sky Brothers Inc. Food Distributors. He was a founding member of Lo-Temp Trucking and Delta Computers, which eventually evolved into Delta Health Systems. Sky attributed much of Sky Brothers’ success to the business philosophy of treating employees like family, as they were a part of creating a workplace atmosphere based on respect, fun, competition, and top-notch service. After selling Sky Brothers to the Sara Lee Corporation in the mid-1980s, Sky retired to pursue a passion in food and marketing through his new business, To Market Two Markets, where along with his family, he developed and patented Botticelli’s Famous Nudels, Oohs and Aahs Cooking with Kids, and his famous Oats To Go breakfast wraps. Simultaneously, Sky continued his entrepreneurial spirit with involvement in In-Range, Chemcut, WINN Capital, Skyward Investments, Toona Town Investors, Empower3, and Procare, among others. Sky was always available to consult entrepreneurs, young and old, and became very involved with Penn State Altoona’s Enactus team, the Sheetz Center for Entrepreneurial Excellence, and the Sheetz Fellows Program. The University has benefited greatly from Roz and Phil Sky’s longtime generosity and support. In addition to their contributions to the Altoona Future Fund and other fundraising initiatives, the couple established the Phillip B. and Rosalind E. Sky Charitable Remainder Unitrust and named Penn State Altoona as the sole beneficiary. Initial funding led to the naming of the Port-Sky Café, and all remaining funds will be used to establish the Sky Family Scholarship, benefiting students with high financial need. The Skys also made a gift to name Port-Sky South in the Sheetz Center for Entrepreneurial Excellence. In 2012, they established the STAR Football Scholarship at University Park, honoring coach Bill O’Brien and the 2012 Football Team. Their continuous philanthropic support serves as a symbol of their commitment to higher education and young scholars at Penn State. 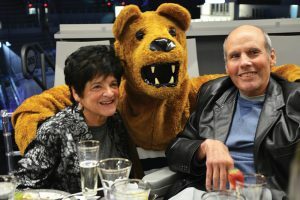 Phil was a life member of the Penn State Alumni Association, and for their philanthropic support, the couple was inducted into the University’s Mount Nittany Society and the Ivy Circle category of Penn State Altoona’s Ivyside Society, the highest level of recognition. Sky was actively involved in the Jewish Federation, the Israel Bonds Program, and early on, the B’nai B’rith Organization. He was a member of Agudath Achim Congregation and the Jewish Memorial Center, of which his father and uncles were founding members. Sky also earned the rank of Eagle Scout. Along with his wife, he was a major supporter of numerous community and non-profit organizations, including the JED Foundation, American Cancer Society, Easter Seals, MS Society, Griffith Family Foundation, Home Nursing Agency, Southern Alleghenies Museum of Art, Blair County Arts Foundation, Central Pennsylvania Humane Society, UPMC Foundation, and the Altoona Area School District’s music program. He and Roz also inspired the “To The Sky Foundation,” through the Central Pennsylvania Community Foundation.